On a scale from puppy playtime to yearly dental cleaning, everyone has a different level of love (or distaste) for exercise. And the closer you can come to not just tolerating but flat-out adoring your workout, the better your results will be. A 2016 study published in the journal Psychology and Health reiterated what many other studies have found: Exercise enjoyment is one (and likely the best) predictor of how much you actually hit the gym, trail or soccer field. Perhaps the most important step in finding a workout that you enjoy is identifying your fitness goals, says Barbara Walker, Ph.D., a sports psychologist with the Center for Human Performance. After all, if you don’t see each and every workout moving you closer to your goal — whether that’s improving your cardiovascular health, getting stronger or tackling your first 10K — you’re not going to enjoy it. Once you identify your goals, you can start to weed out those forms of exercise that really aren’t a good match. You wouldn’t take up cycling if you wanted to get a ripped upper body, right? 2. Are You a Creature of Habit or Do You Thrive on Variety? Some people love consistency, while others get bored easily. What’s your M.O.? Whatever’s true when it comes to things like food, music and after-work activities will likely hold true for exercise, says Walker. If you’re a creature of habit, you might be content going for a run every day before work or pumping iron on your lunch break. But if you prefer to mix things up, you might need to consider running on some days and lifting on others, rotating through your gym’s group classes or trying a boot camp that’s all about keeping your body guessing. It’s human nature to enjoy the activities you’re good at and hate the ones that don’t come naturally. In fact, a 2013 review of 38 studies on motivation and exercise habits published in Medicine and Science in Sports and Exercise found that confidence in your exercise ability is a primary factor in not just how much you like exercise, but also how often you’re apt to actually break a sweat. So play to your strengths, says Walker. Even if you’re an exercise newbie, you undoubtedly feel like you’re better at some things than you are at others. Start there, and as you progress you’ll build the confidence to expand your horizons. 4. Do You Like to Sweat It Out Solo or with Others? Some people regard gym time as alone time. Others thrive on social support and just aren’t going to have a fun time exercising if they aren’t with friends, says Patrick Thompson, a certified personal trainer with the Trainerize online training app. You need to know which you are. Swimming laps and lifting on your own can be great if you just want some personal time to clear your head, but a cardio-dance class or even a small group training session is going to be infinitely more fun if you’re an extrovert. Also, it’s important to realize that there’s a large range of what working out with others can look like, notes Victor Self, a master instructor with Flywheel Sports. You could join a running club, lift with a friend or work with a trainer in either a large or small group or even one on one. 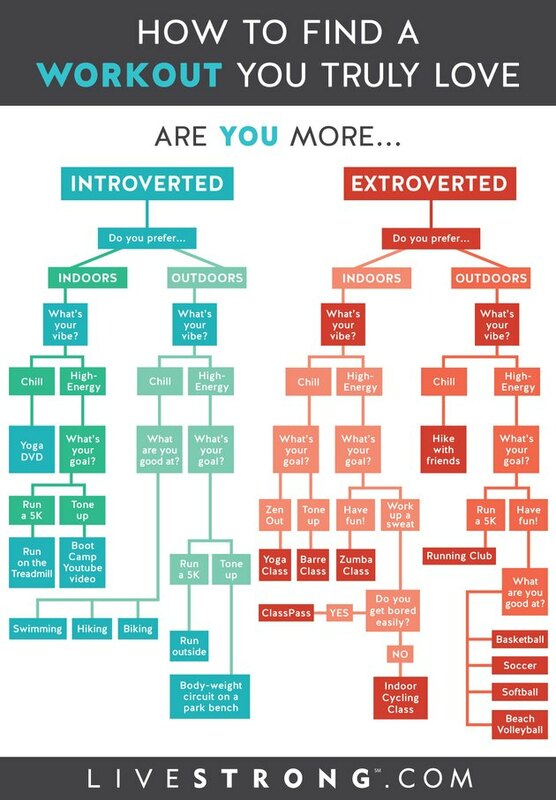 Read more: Quiz: Are You an Introvert or an Extrovert? 5. Do You Like to Be Indoors or Outdoors? “Finding the right environment that supports your physical and mental health equally is crucial,” says Self. For instance, while research published in 2011 in Environmental Science and Technology shows that people report greater exercise enjoyment when they break a sweat in the great outdoors, that doesn’t matter much if you love air-conditioning and have an aversion to mosquitos. And remember, even a lot of traditionally indoor workouts like strength training can easily be performed outside. All you need is a playground or park bench. 6. How Do You Feel About Team Sports? Meanwhile, if gym was your least favorite class back in high school, you might want to stick with more traditional workouts like cycling and yoga. “What types of classes motivate and inspire you? Do you want a high-energy environment, or do you prefer a quieter, lower-energy atmosphere?” says Self. Even within the same type of exercise, there’s a lot of variation out there in terms of atmosphere, which often depends on the instructor. Once you’ve answered these questions, it’s time for some experimentation! And don’t be afraid of a healthy dose of trial and error, says Self. By trying out anything you think might be a fit — he recommends giving any given workout three attempts before calling it a “no” — you can learn more about your fitness personality and what’s really going to click for you. Surf YouTube for some at-home workouts to get a feel for all of the different exercise protocols out there, ask gyms in your area about any available visitor passes or sign up for a ClassPass membership, which will let you try out an unlimited number of different exercises per month. Enjoy the process knowing that, once you find your fit, all of the work is totally worth it.